Miss Kelly is famously crowned as Australia’s Queen of Burlesque and is an	internationally renowned comedian, performance artist, aerialist and character	actor. 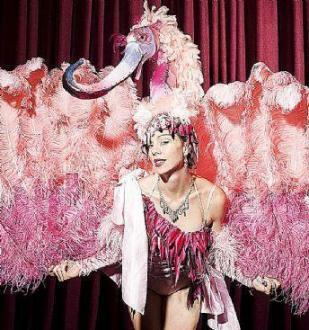 She is unusual in the burlesque world for her ability to work many	different styles from classic, comedy, theatrical, grotesque and circus. Her	aesthetic is highly visual and her costumes are professionally crafted	artworks. She has completed a BFA in performance (COFA NSW), a circus degree (ZACA UK) a	National Institute of Dramatic Arts (NIDA NSW) degree in directing and a degree	in film making (Sydney Uni., NSW), Imogen is a consummate performer of twenty	years experience, a talented aerialist and has performed in The UK, Japan,	China, Mongolia, Nepal, India, Thailand, Germany, France, Spain, Mexico,	Singapore and the USA. She has graced the stages of The Opera House,	La Clique, The Assembly Rooms Edinburgh, New York Burlesque Festival and	Tease-o-rama.